This postcard has ‘POST CARD’ on the back but no information about who produced it. It is thought to be a print by H. Gordon Tidey, however, and shows ‘Improved Precedent’ or ‘6ft 6in Jumbo’ or ‘Big Jumbo’ No 1678 Airey in plain black livery. 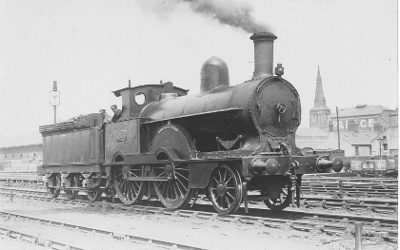 The picture is indeed by Tidey, S614, and was taken at Carlisle in 1925. Not sure of the exact location. Yes. It is Carlisle just south of Citadel station alongside Crown Street Goods Depot . The Palace Theatre and spire of Christ Church in the background confirm the location. Yes, it is Carlisle, looking north from alongside the main line about 300 yards south of Citadel station, which is off to the left. The ex-LNWR Crown Street goods depot is visible behind the engine's tender; the Palace Theatre and the steepled Christ Church, both on Botchergate (the A6 road), are prominent on the right. Anyone know which line it's standing on? Running line or siding? From the O.S. 1:2500 plan surveyed in 1924 and other contemporary photographs, the engine is not standing on a siding but on the Maryport & Carlisle Down line, and is presumably about to reverse into the station. The track in the foreground is the eastmost of the three sidings on the west side of the line. Thanks Harry! I'm happy with that.